Patellar tendinitis is an inflammatory condition which affects the tendon connecting the kneecap (also known as the patella) to the shin bone. The patella plays a big role in the way you use your leg. It helps to extend the knee for activities like running, jumping and kicking. 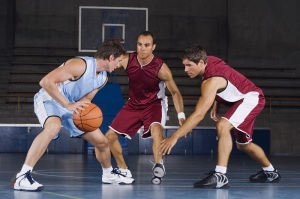 Patellar tendinitis is commonly known as “jumper’s knee” because it occurs in athletes who play sports that involve frequent jumping, such as in volleyball and basketball. Repeated stress on the patellar tendon results in tiny tears to the tendon. The body attempts to repair these tears, but as the number of tears increases, pain and inflammation results, as well as a weakening of the tendon. If left untreated, you could develop a more chronic condition known as patellar tendinopathy. Knee pain is one of the first signs that indicates you may be experiencing patellar tendinitis. The pain typically is centered between the kneecap and the shinbone. The pain may be present only when you participate in physical activity, or just after an intense workout. The pain could progress to the point where it begins to affect your performance in sports and may interfere with everyday things such as climbing the stairs or getting up from a chair. If you experience knee pain as an athlete, you may decide to try self-care methods first, such as icing the area, and reducing or avoiding activities that worsen your symptoms. If, even following these basic treatments and activity modifications, your pain begins to inhibit your daily activities, or is associated with swelling or redness, contact your doctor. At his practice in Beverly Hills, orthopedic surgeon Dr. Meier provides patients with treatment for knee ligament injuries. Intensity and frequency of physical activity. Sports that involve repeated jumping such as basketball and volleyball tend to put athletes at an associated risk of developing patellar tendinitis. Increases in the intensity or frequency of activity. New, or more strenuous activity can put a high amount of stress on the tendon. Cramped, tightened leg muscles. Decreased flexibility in the quadriceps and hamstrings could increase the strain on your patellar tendon. Muscular imbalance. If some muscles in your legs have more strength than others, the stronger muscles could pull harder on your patellar tendon. These imbalanced forces pulling on your knee could cause tendinitis. Your doctor may prescribe medications or recommend over the counter pain relief products to lessen short term pain from patellar tendinitis. Physical therapy may also provide relief from pain. Stretching and strengthening exercises can be a useful tool in treating jumper’s knee. If these simple treatments aren’t working to relieve the pain, your doctor may recommend a more invasive treatment, such as an anti-inflammatory injection or possibly even surgery. Meier Orthopedic Sports Medicine can help with the treatment and prevention of Patellar Tendinitis. If you are experiencing knee pain, contact Dr. Meier today at 310.736.2793 or fill out an online contact form. Next, read The Purpose of Joint Preservation.